Some weeks everything works out. I get home from work at descent times, the pets all behave, I avoid whatever cold virus is going around and the food I cook works. Some weeks, I get sick, the cats keep me up half the night, I spend way too many hours at work and the food just doesn’t come out the way I expect. This week was a little of both. just did not end up working. Both Bob and I were feeling a little under the weather by this point, so the pungent, heavy goat cheese (not your typical fresh, mild goat cheese) overpowered the dish to the point that we just could no eat it. The roasted orange peppers didn’t help any. Talk about a clash of favors. On the up side, the pizza we ordered was good and we had leftovers for the next day when not only did I get out of work way too late, I also succumbed to Bob’s cold. After that mild disaster, I was a little reluctant to try something totally new again. I do this. Something doesn’t work and I get scared to try again. I loose confidence in my palate and cooking skills. 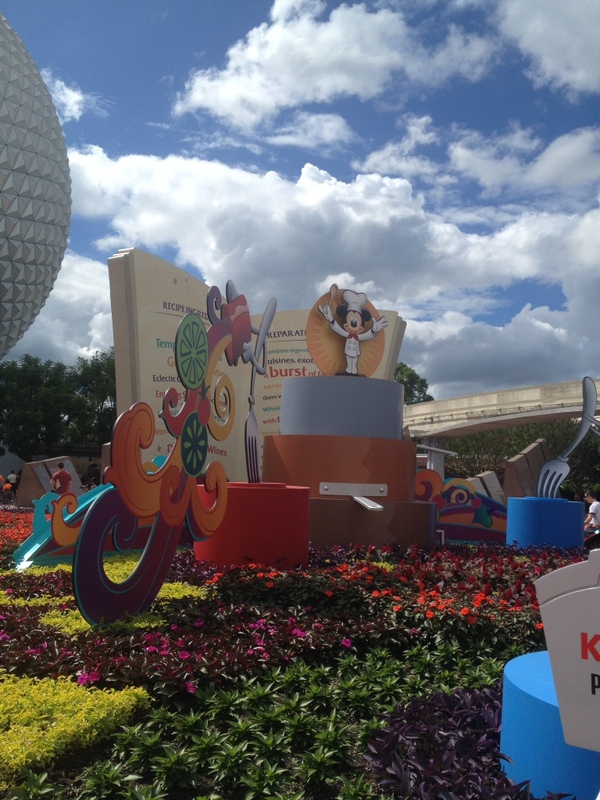 But … Once I felt better Sunday, I tried again. 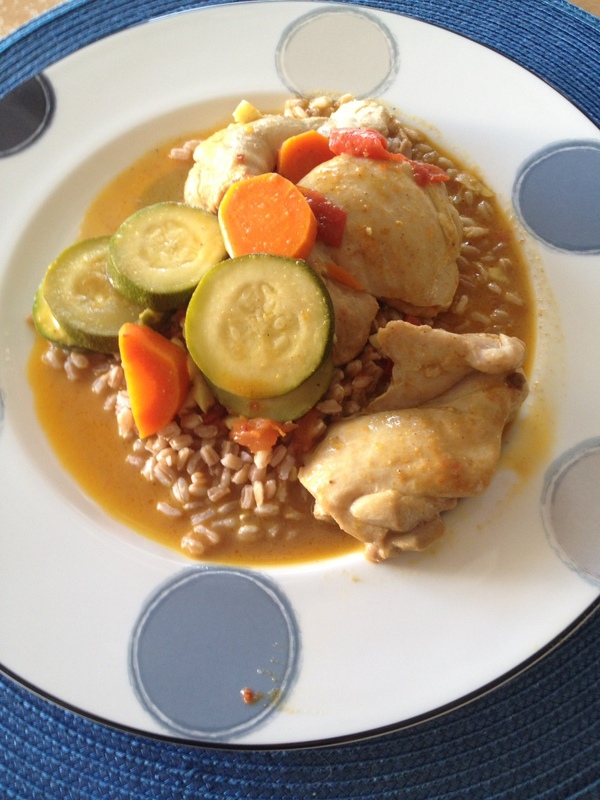 Oh, not the same thing, but a new experiment – curry! I took some chicken thighs and just browned them a little; I took them out of the pan and added chopped garlic and just sautéed that a little. I then added tomato paste, chili paste, and curry powder. Mixed all of that together then added coconut milk and some chicken stock. I let that mix and simmer and was tempted to chuck it (whole lack of confidence thing) then added salt, pepper, a little more curry powder and a cinnamon stick. I let that boil and then simmer for about 15 minutes then added the chicken back in along with some chopped tomato, zucchini and carrots. I let all of that cook for about 20 more minutes and then put the whole thing over some left over faro. The result …. Spot on flavor, but a thin sauce. I added too much chicken stock (about 1.5 cups to one can of coconut milk) and didn’t let it thicken enough. But the flavor was really good. Bob loved it and I got my kitchen confidence back just a little. 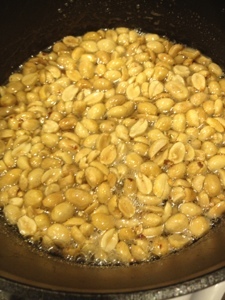 Enough to attempt peanut brittle today! 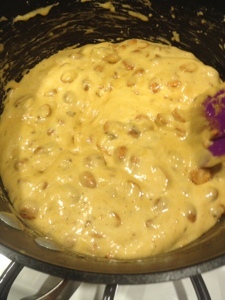 Peanut brittle sounds simple – sugar, corn syrup, water and peanuts. Just get it all up to temperature, add some butter and baking soda and you are good. But …. 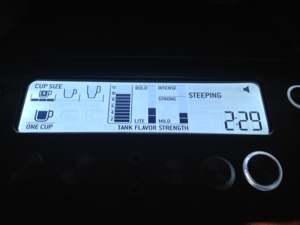 I am impatient, so the waiting was torture and then I realized I was having a hard time stirring because … well …. 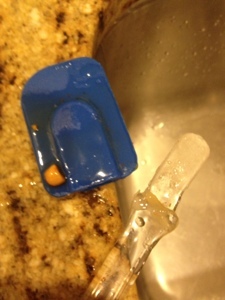 plastic handled scrapper is not the best instrument to use when getting candy to 300 degrees. It’s not clear candy like the picture, but it does taste fantastic. So I’m ok with cloudy candy for a first attempt. which really is very neat. 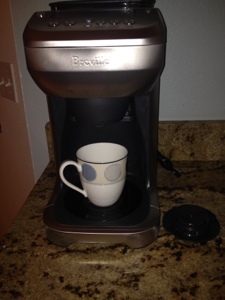 But it is taking some getting use to and part of me misses the old coffee maker. 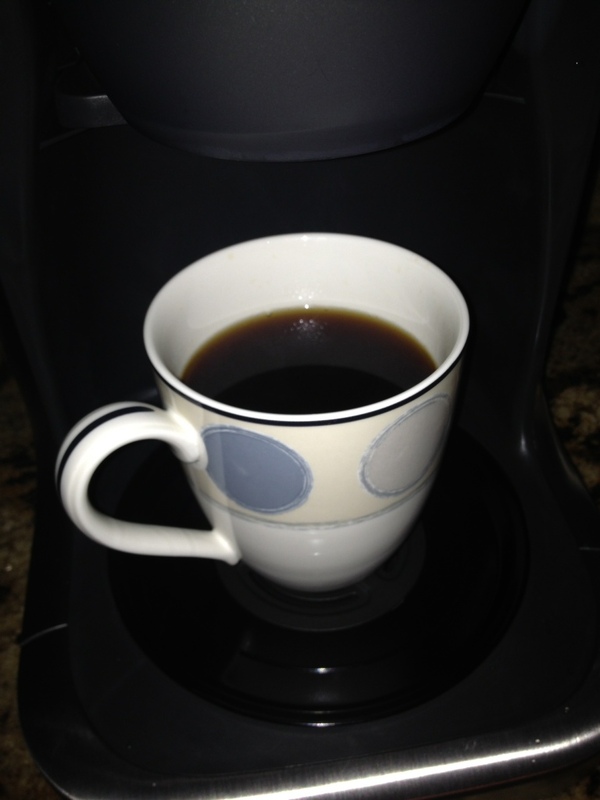 But really, I just want my morning cup of coffee. Today was a day where I wanted to spend it in the kitchen, cooking or reading cookbooks, cooking blogs or cooking stories. Some people take pleasure in cleaning or planting flowers or doing a home project. I take pleasure in cooking, so today, in between laundry and catching up on reading for my class (yes, I’m insane enough to take an online class while working) I cooked. I wanted to go a little more traditional today. It’s been a while since I’ve made a meat, vegetable and starch plate, but I was in the mood. We picked up a nice flank steak the other day, so I marinaded that in some soy sauce, canola oil, chili garlic paste and shallot overnight. 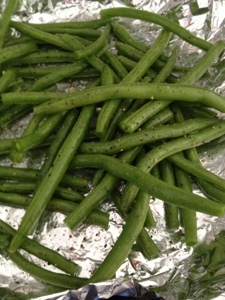 While the steak was coming to room temperature today I coated some green beans in oil, salt and pepper. A really nice little lunch. Bob was super happy with the steak and I have to say, it was pretty near perfect. Silky texture and tons of flavor. 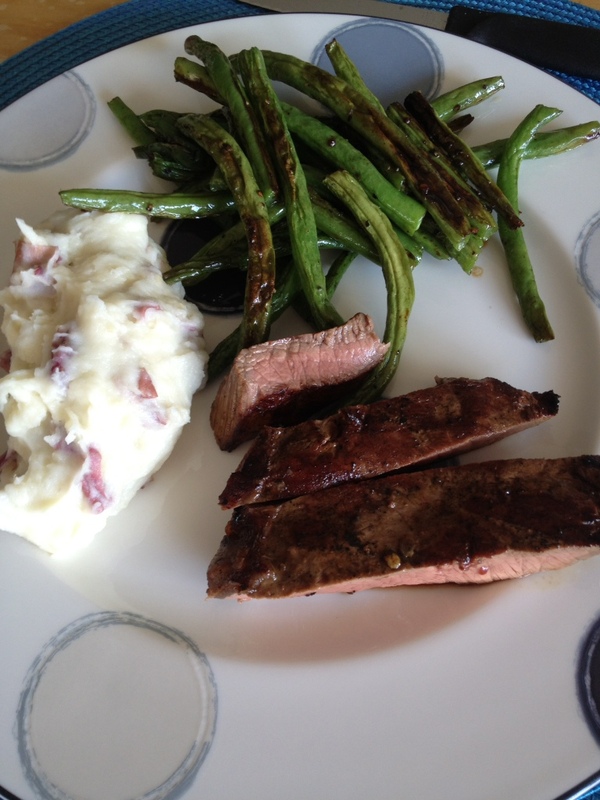 The green beans and potatoes were super flavorful and it was a homey meal. Perfect for a fall day. but in retrospect, I should have; there is just a lot more flavor when they are roasted in pieces. But … everything into the food processor with some vegetable stock, purée well then add the roasted garlic and some spices (curry powder, salt, pepper and nutmeg). 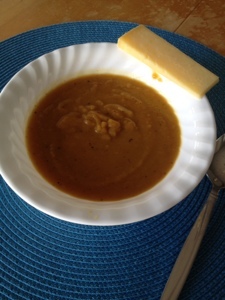 It was good, but not as good as the pure butternut squash soup from a few weeks ago. I did pair it with a nice Zinfandel and the Georgia Gold cheese from yesterday’s basket and it was a fantastic little dinner. And I have to bake, or do dessert. I just have to. Diets be darned, dessert is too important to pass up. I wanted something peanut today. 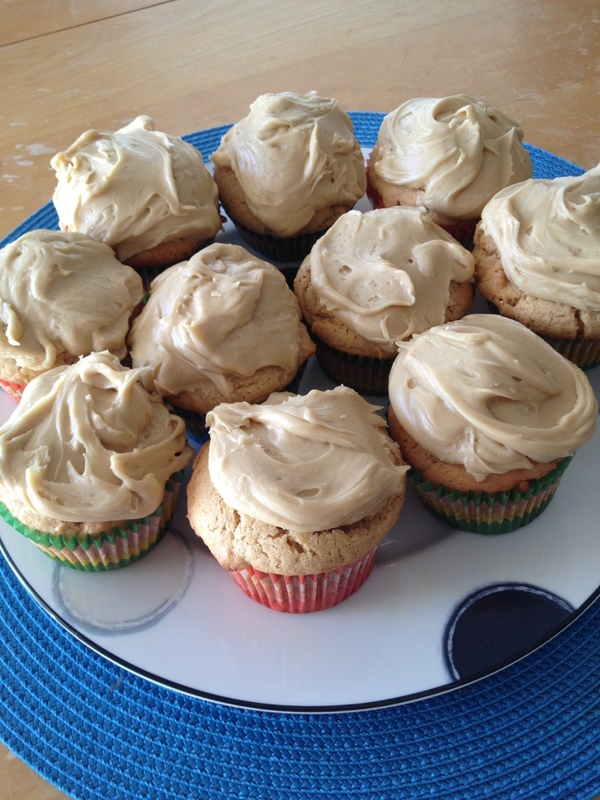 So I scoured recipes and found one for peanut butter cupcakes. Ok …. I can do that and Bob was all on board for these. So … I had everything except the brown sugar. 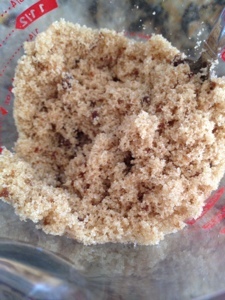 But I did have white sugar and molasses, so … I made my own brown sugar. 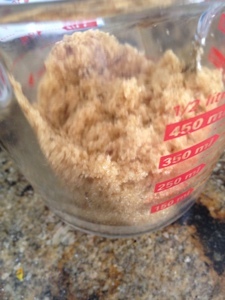 I may never buy brown sugar again, this was so easy. 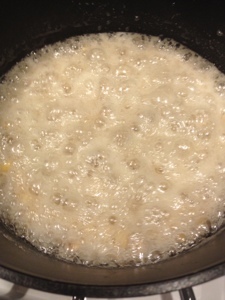 One cup sugar, one tablespoon molasses and mix. That’s it. 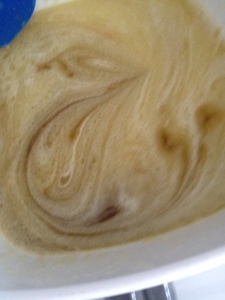 Add more or less molasses to change it to light or dark brown sugar, but there you have it. But … Cupcakes. 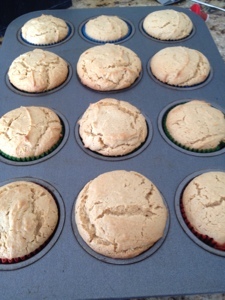 They need something to top them, but I am horrible at icing. Ever since trying to make Grandmom’s chiffon cake icing I have failed at every turn. But I try again. 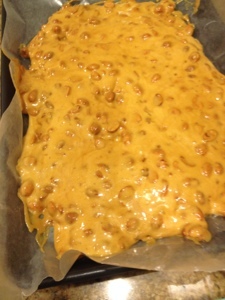 First I made caramel – this I can do. 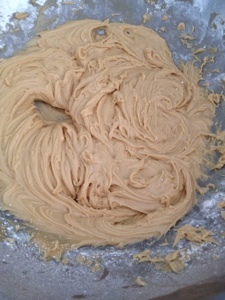 then beat the caramel with a mixer and slowly added in confectioner sugar. Sure enough, I had icing! I was actually able to make cupcakes with icing and oh boy were they good. Sweet and salty with a touch of savory thrown in. … Actually, I think I want another. Hope everyone has a good week! Fall has come to Sarasota with the snowbirds, traffic and perfect weather. It really is lovely here this time of year, and it reminds me of why I don’t live in the northeast anymore. One of the best parts of living in Sarasota is small, local shops. 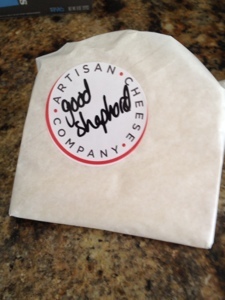 One of our favorites, the Artisan Cheese Company put together a cheese of the month club that Bob and I decided to take advantage of. Three cheeses each month – about a pound and a half of cheese – that we get to try and determine if any will be our new favorites. 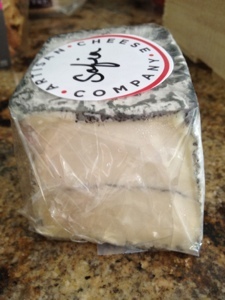 This month we had one goat cheese, one sheep cheese and one cow cheese. I love variety and I’m not sure I would have picked two of them, but I’m sure glad Louise thought of these. Goat cheese is a favorite of mine, but this one Bob liked more than I did. It reminded me a lot of Humbolt Fog, which is a pretty earthy cheese. This one is no different. 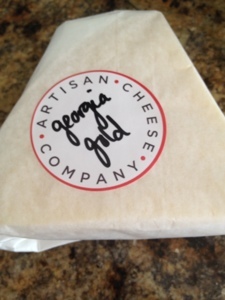 Very good, lots of different flavors throughout the cheese, but very strong. By itself, I have a hard time eating it, but combined with a cracker and some honey, and it’s fantastic. Don’t try it with apple; the acid and tartness of the apple clash with the cheese. Sheep cheese is also a favorite of mine. Delicate favors that usually pair well with almost anything, but especially wine. 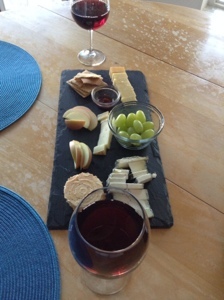 In this case, the cheese was mild, almost deceptively so. If eaten by itself, it had a lot of flavor, but paired with honey, apples or crackers and it just compliments. It doesn’t compete for center stage, but is a fantastic supporting character. Normally cow cheese is ok. Not my favorite, but a standard cheese. I almost never think of cow cheese as anything special, but this one changed my mind. Out of the three we had this month, this was by far my favorite. The cheese has a ton of flavor, deep flavor. It pairs well with wine, apple or honey, but also stands up on its own. This was Bob’s second favorite this month, but my favorite. The nice thing about a basket like this is we have dinner for tonight and I have lunch all week. 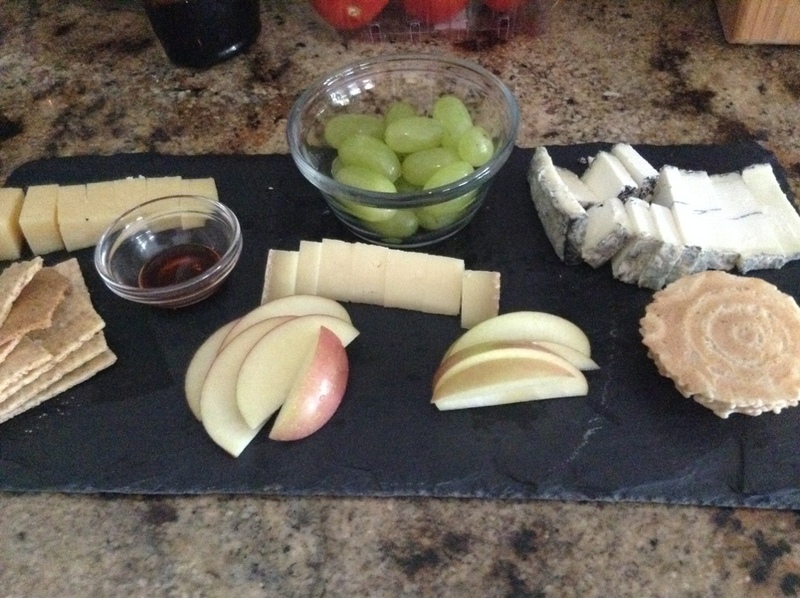 Cheese, crackers and fruit – I’ll be in heaven. Should make work just a little better and we should have some interesting salads or main dishes incorporating the cheese over the next week. /happy dance. This may be one of my better ideas. And simply because I love to support small, local businesses, if you are even remotely interested in artisan cheeses, really good artisan cheeses, check out the 3 month cheese club – you don’t have to be a local to get fantastic cheese. 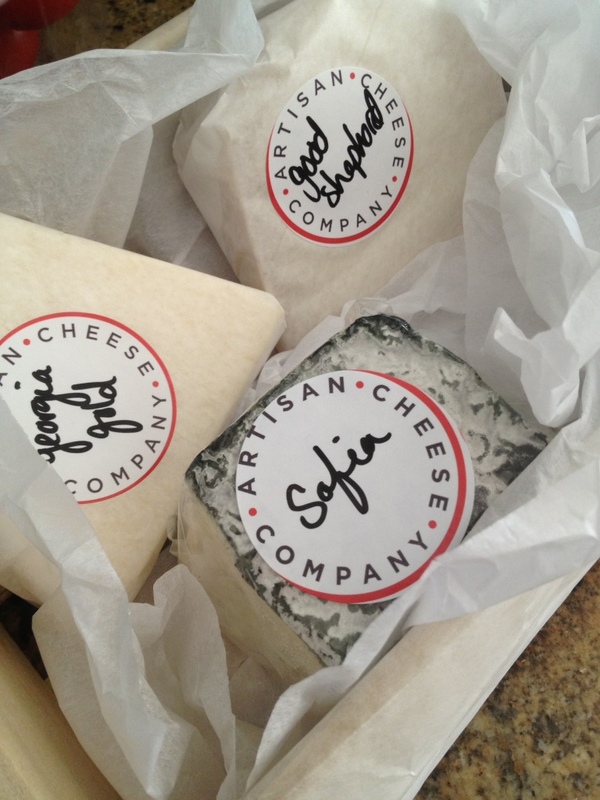 And if you are in Sarasota, stop, by – Louise and Parker, and the staff, love talking cheese with people. We even got great recommendations for when we traveled to England. We had another busy week here. I worked overtime every day this week, which is unfortunately not unusual. I had hoped to get one time Friday, but my boss wanted me in a meeting at 4 Friday afternoon. Nothing bad, but just one of those things. Bob and I have been going back and forth on food choices. Last year he wanted to cut back on grains, especially wheat. We gave that a try, but found it involved eating lots of meat. Now he is ok with cutting back on meat and adding in a few grains. I’m still trying to keep the processed wheat out and extra sugars – pasta, bread, etc. – are limited. (To be fair, I should cut out more desserts, but I’m just not willing to do that.) But, with the idea of less meat I’ve broken out the vegetarian cookbooks and had fun. When one gets home after 6 and wants something healthier than pizza or Chinese (the two delivery options) a salad can work great. I picked up a butternut squash the other day so that became the point of departure for this salad. Roasted butternut squash with carrots, cucumbers, pecans, goat cheese, field greens and a white balsamic shallot vinaigrette. The squash roasted while I prepped everything else so in 40 minutes we had dinner. I also like this one with chicken, but as I didn’t have any on hand, the vegetarian option it was. 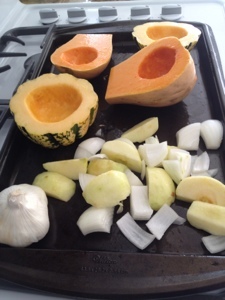 while roasting 1/2 a butternut squash, 1/3 of an onion, and garlic in a little canola oil and balsamic vinegar. After about 20 minutes in, I added 2 chopped tomatoes to the tray and put it all back in the 375 oven for another 15-20 minutes. 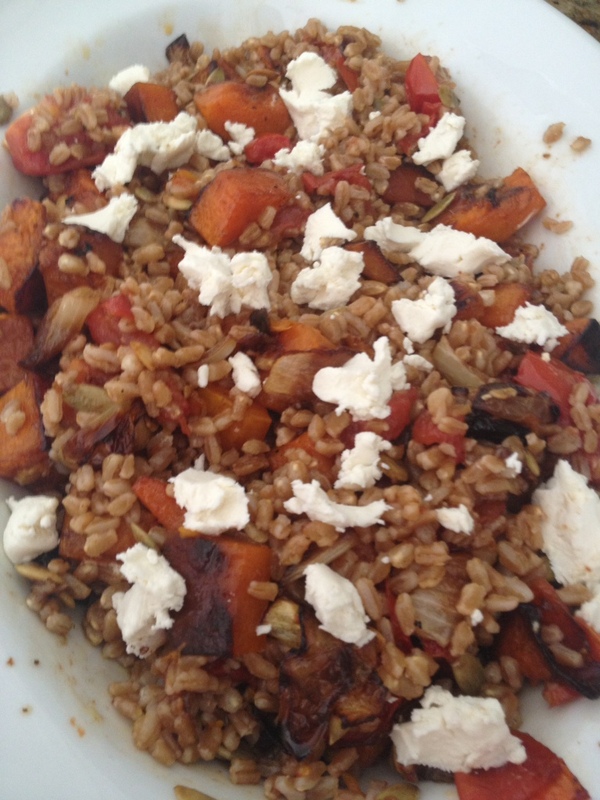 I added the roasted vegetables to the farro but removed the roasted garlic. I took the roasted garlic (about half a bunch) and mixed it with a little olive oil, a touch of black truffle oil and a splash of balsamic vinegar. 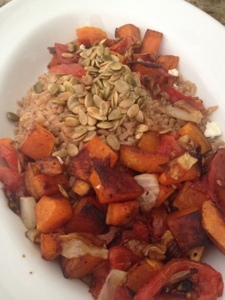 I also toasted some pumpkin seeds (thank you Val for the idea) and added those to the salad. Pour the dressing on and mix together. I topped it with a little goat cheese and we had lunch. I need to add a little salt to it at the end, but otherwise this was fantastic. 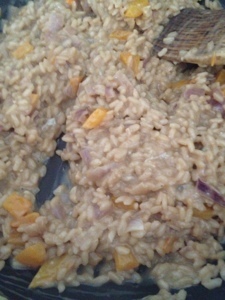 Bob said he liked it more than my butternut squash risotto and he could eat it every week if I wanted to. For a vegetarian dish, I thought that was high praise. What I liked most about this was the textures. 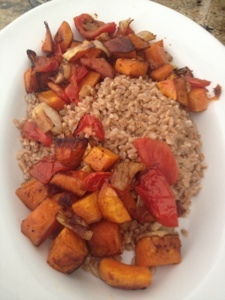 The farro has a good mouthfeel and a little nuttiness to the flavor. 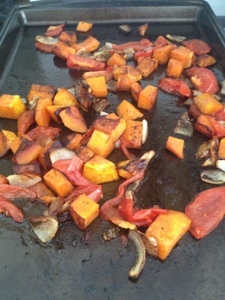 The roasted vegetables really took the place of meat here, even the tomatoes. 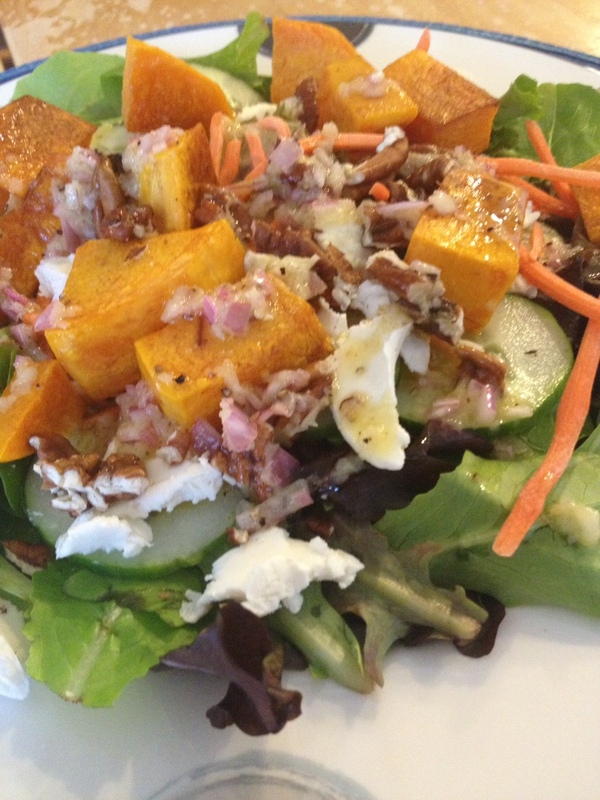 The pumpkin seeds added a crunch and the goat cheese was just a nice topping. The salad would honestly be just as good without the goat cheese and then it goes from vegetarian to vegan. But a good dish, a hearty dish and a dish I would serve to anyone I know and be proud of it. Which, I suppose means it was a successful dish. 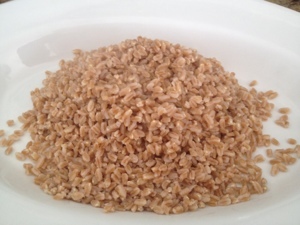 And yes, while farro is a wheat type grain, it isn’t wheat as we think of it. It is a grain all on its own. I like this NYT article from a number of years ago to explain. While heavy of the food scene and restaurant usage of it, it still gives a good, basic explanation. I’m still scouring cookbooks for this weeks recipes, but I know it’s going to be a long week at work. Think I need simple and quick again.